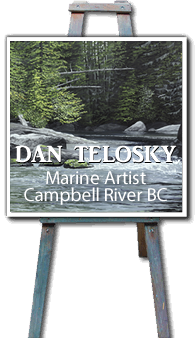 Dan Telosky grew up along the shores of Discovery Passage on Vancouver Island, with a clear view of British Columbia’s marine environment. His interest in, and affinity for, B.C.’s working boats has grown over the years, and what began as artistic dabbling has advanced to his all consuming passion. It takes many hours, for Dan to painstakingly produce a painting that completes his vision, without compromise. Combining the understanding that comes from years of being on the water with his keen eye Dan creates his acrylic paintings. 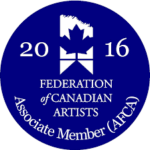 He is a member of the Canadian Federation of Artists and the International Society of Marine Painters. 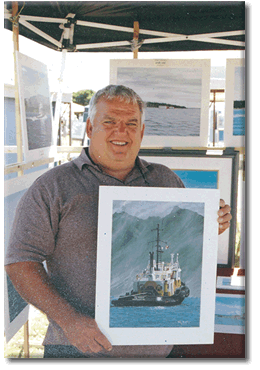 Last year at the Sidney Fine Art show the painting “Seaspan Navigator off April Point” won an Honorable Mention award. His pictures are as far away as Germany and Texas, but the bulk of his work is near where he paints, on Vancouver Island.